A very brief overview of the process involved in stroking a crankshaft to obtain a larger capacity engine without changing the overall external dimensions of an engine. A process where the internal cubic capacity (CC) of an engine is increased or decreased without any changes to its external physical size. Over boring an engine will slightly increase the cubic capacity (CC) of an engine but can sometimes be detrimental to the longevity of the engines life. Boring is the process of taking material out of the cylinder walls to a specified size to fit oversized pistons. This is a good way of getting rid of bore wear or any trauma the bores may have sustained, but in doing so will lessen the wall thickness of the cylinder bores making them slightly thinner. With factors like core shift and boost added into the equation, this can lead to a short term, good time. Stroking a crankshaft is another way of increasing the internal CC�s but with far greater gains. This is achieved by increasing the stroke or throw of a crankshaft pin, while decreasing the size of the big-end journal and essentially moving the centreline. You can either buy an aftermarket stroker kit or put together a combination that will suit your particular application. When setting up to grind big-end journals on a crankshaft, we offset the journal to the factory stroke, and the journal will grind round within a few thou (thouandths of an inch) dependant on wear and other factors. When we stroke a crankshaft we offset the crank the factory amount and then move it higher by the pre-calculated amount, the big-end journal will run offset but will end up true by the time all of the material has been removed. If we are increasing the stroke by 2mm, we offset the grinder chucks by 2mm, the journal will start to grind from the backside through round to the top side and by the time we have removed our 2mm of material and made the journal perfectly round and true we have increased the stroke. The main thing to remember in this process is that, the material removed is the total amount we have stroked the shaft by, in doing so we have effectively raised the centre line of the journal by 1mm, gaining an increase in stroke of 1mm at the top (TDC) and 1mm at the bottom (BDC). 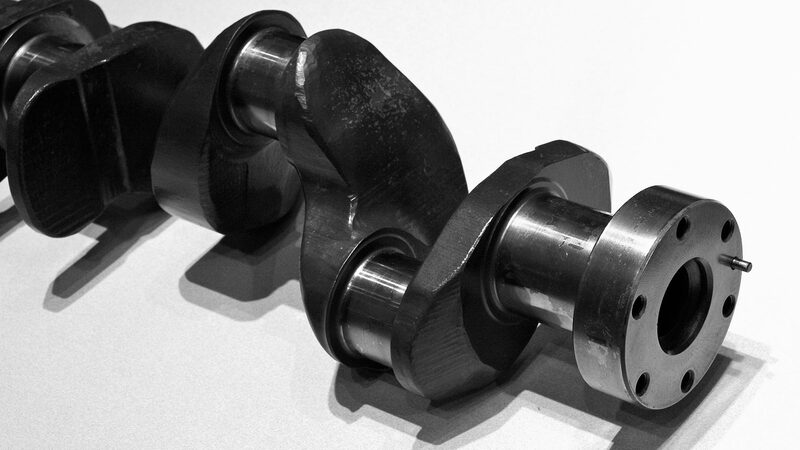 In today�s market many performance companies offer forged stroker crankshafts off the shelf. You can normally buy them as a package with conrods, pistons and everything else to complete the rotating mass of your bottom end assembly, or you can just buy the crankshaft from one company and then buy the conrods, pistons, etc from any number of other performance companies.